As I sit here typing, it's hard to believe that this time last year, there were only 3 of us. 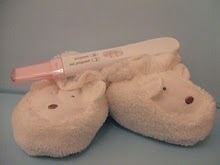 December 17th 2009, exactly one year ago today, was the day those 2 pink lines appeared on the pregnancy test - the day we found out 3 would become 4, the day that I found out that I was going to be a 'Second Time Mummy'. It feels like we've been a family forever. So much has happened since that exciting day - we've had highs and lows - but 2010 has been a fabulous year and I feel so happy to be blessed with such a wonderful family. ahh beautiful. How things change in a year!